It's likely that Scrabble is the most popular word game ever published. But playing it can lead to debates with your opponents over what words are legal to use in the game. Luckily, the publishers have provided an official Scrabble dictionary. The current official dictionary for Scrabble is Merriam-Webster's Official Scrabble Players Dictionary, Fifth Edition, published August 6, 2014. This dictionary is also referred to as OSPD5 and can be purchased at bookstores or online. It included a few handy new two-letter words that were missing from the fourth edition. These are DA, GI, PO, and TE. The prior edition, the Merriam-Webster's Official Scrabble Players Dictionary, Fourth Edition, was published in 2005. It created controversy by introducing the two-letter words QI and ZA, which are extremely useful for making high-score words. These are still valid words in the fifth edition. You can also use the online tool at Hasbro to look up official Scrabble words. It will give the definition of the word and show related words. Or, use a similar tool at Merriam-Webster. The Merriam-Webster tool can be more useful as you can search by "starts with," "ends with," or "contains." You can also use the question mark as a wildcard to represent any blank tiles or any letter. For official club and tournament play, players use the Official Tournament and Club Word List, Third Edition. This is also published by Merriam-Webster and is known as OCTWL3, OWL3, OTCWL2014, TWL2014, or TWL3. It was published in 2014 and took effect in tournament play in the United States and Canada on April 10, 2015. It is available only to members of the North American SCRABBLE Players Association, which is the successor of the National Scrabble Association as of 2009. The third edition contains all of the words in the Official Scrabble Players Dictionary Fifth Edition, but also includes words that were expunged from that book because they were deemed offensive or too colloquial. It is available in a print and electronic edition. 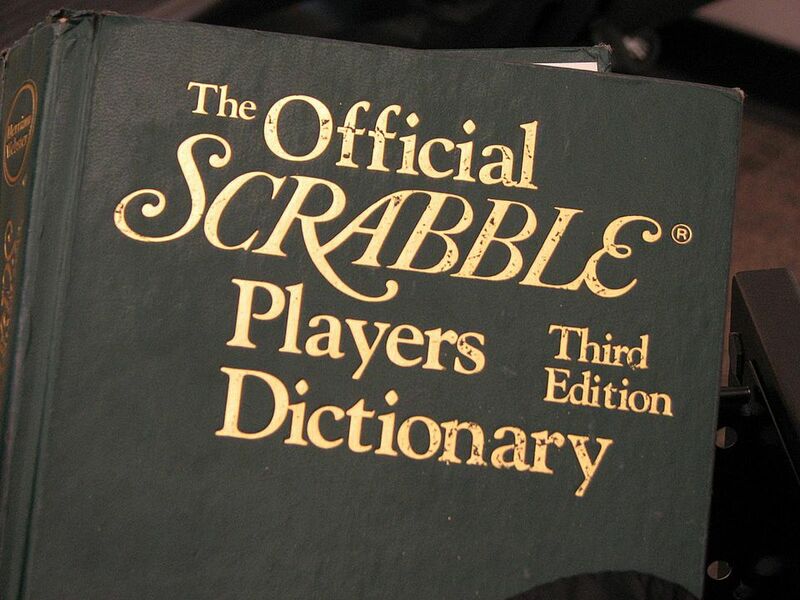 The need for an official Scrabble dictionary came about as tournament and club players wanted an authorized dictionary. The Funk & Wagnalls Standard College Dictionary was the first official word source. Selchow and Righter asked Merriam-Webster Inc. to produce the dictionary using only words that appeared in five collegiate dictionaries. These were those from Random House, The American Heritage Dictionary, Webster's New World Dictionary, Merriam-Webster, and Funk & Wagnalls. The first edition was published in 1978, with the second edition released in 1991. When offensive words were eliminated from the third edition of the Official Scrabble Dictionary, it prompted a revolt by the members of the National Scrabble Association. This lead to the publication of the Official Tournament and Club Word List. Of course, casual players can always agree to use any dictionary they have handy.